Susan Today: And the Hunt is On! And the Hunt is On! I know I have mentioned tingly toes before, but I have finally decided it might actually be an issue. One week before my impromptu half marathon, my 3rd and 4th toe on the left foot went numb. I have barely had any sensation other than tingly toe in them since. Sounds fun, right? It doesn't hurt or anything, it is just a weird feeling. I ran the half with no issue, but the pads of my feet were a bit achy, which means mama needs new running shoes anyway. And the hunt is on! I started researching a bit about the tingly toe issue I am having. I may or may not have an actual condition called Morton's Neuroma, more or less a compressed nerve bundle in the foot. It is common, but also more often accompanied by pain and the feeling of standing on a marble. That part I don't have. I am hoping that means I am A. Only in the early stages, or B. Just have nerve compression/ a pinched nerve. There is also the possibility it is nerve damage from a childhood injury. I stepped on a tent stake at a swim meet. Either way, I need shoes, and decided not to settle for what I have been wearing. I went first to my local running store. I tried new stuff, and he eventually fitted me into Brooks Glycerin but a 1/2 size smaller than what I usually wear. I wasn't thrilled to be honest. I felt like there had to be other options. And the the size change really concerned me. I ran 2 days in them, and just wasn't sold. Mini-Me and I returned them within the week. Next up Zero Drop Altra's. I decided to try these based on information from a fellow runner. You can't buy them in the store, so I had to order 2 pair in various sizes to try. I also got Mizuno Evo's at the same time, but the initial feel of those put them right back in the box. The concept of a zero drop is supposed to mimic a natural step - no elevation change from toe to heel. This was a dramatic change for me. I have a pretty high arch and wasn't sure what to think, but willing pretty much to try anything at this point. I wore them all day after they arrived. Then ran 2 miles, and that was it in the evening. My arches and ankles ached SO bad the next day, that I actually iced my feet more than 24 hours later. BLAH. RETURN. Another running friend suggested Sketchers Go Runs. I know what you are thinking... Sketchers for running?! But seriously, they have 3 different styles and an Olympic ultra marathoner wears them. They have some engineered design to promote a mid-foot strike. We happen to have a Sketchers store, so I made the trek this past weekend. All the running shoes were 20% off, and I could return them anytime within 30 days to get a full refund. Of course, I bought them. I wore them all day yesterday, and they felt okay. Then I ran for 1 mile in them today. I could feel the way they "promote the mid-foot strike", and honestly didn't love it. I felt I was running very heavy. I could feel every move of the treadmill and hear it, which isn't normal. Next! 5 pairs arrived from Running Warehouse yesterday afternoon - 4 pairs of Nike and 1 pair of New Balance. I used their modeling tool to determine size and fit based on the good fit of my first pair of Glycerins. First, I tried them all on, which immediately ruled out the Nike LunarGlide. New Balance almost never fits, but they were ok, so they were given a reprieve to the run test. Nike Free 4 and Nike Free 5 felt comfy, but also needed the run test, and the Nike Air Pegasus were like a slipper. I left those on for the rest of the evening, and you know, I started to regain feeling in the toes! Once the kids finally settled in bed, I went down for the run test. I ran 1/2 a mile in each shoe. Pegasus felt fantastic, truthfully. The NB was ruled out pretty quickly. I remember why I never choose them. There is something in their design that pushes on the front part of my arch, and the toe box was way tighter than what I can handle. Nike Free 5s have this trim on the outside of the toe box. On the left foot, it was in perfect alignment with my little toe. Scratch... Nike Free 4s have an interesting tongue situation - it is attached on one side. I like the feel of them walking and running, so they have also earned a spot in the testing pool. I plan to give it a week or two alternating between the Free 4s and the Pegasus. Running Warehouse actually gives you 90 days, which is fantastic, but I won't need that long to decide. My next half is in 32 days. No time to waste! I have high arches and LOVE my asics gel nimbus shoes!!! 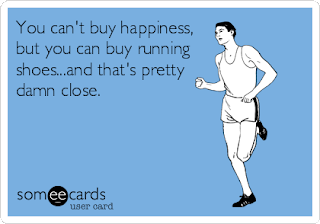 I got mine at a running store where I was fitted... any other shoe I have tried my arches get sore and inflamed after the run! Holy moly that's a lot of shoes! Hope you find one that works. I definitely think I need something different on the next go around.